[FREE IRAN Project] In The Spirit Of Cyrus The Great :: View topic - 18 Tir Schedule of Demonstrations in Europe and U.S.
18 Tir Schedule of Demonstrations in Europe and U.S.
Posted: Wed Jun 23, 2004 11:23 am Post subject: 18 Tir Schedule of Demonstrations in Europe and U.S.
Time: Wednesday, July 7, 2004 � from 5 to 8 p.m.
Time: Thursday, July 8, 2004 from 11 a.m.
Kempenski) located at the junctions of North Dallas Parkway and Arrapaho Rd. Time: Saturday, July 10, 2004 - from 3 to 5 p.m.
Time: Saturday, July 10, 2004 � from 2 p.m.
Time: Thursday, July 8, 2004 � from 5 to 6 p.m. Organized by: The Constitutional Party of Iran, Iran�s Freedom Forces, Iranian Freedom Movement, Munich�s democrats. Time: Thursday, July 8, 2004 � from 12 noon to 4 p.m.
Time: Thursday, July 8, 2004 � from 4 to 6 p.m.
Time: Thursday, July 8, 2004 � from 4 to 7 p.m.
Time: Wednesday, July 7th, 2004 - from 12 P.m.
Time: Thursday, July 8th, 2004 - from 1 p.m.
Time: Thursday, July 8th, 2004 - from 7 P.M. to 9 P.M.
Time: Saturday, July 3th, 2004 - from 2 P.M.
Time: Wednesday, July 7th, 2004 - from 2:00 P.M. to 4:00 P.M.
درود به روان تمامی سالار زنان وشیر مردانی که در راه مام میهن جان خود را ارزانی داشته اند . سپاس ازتلاش تمامی رزمندگانی که درراه آزادی وسربلندی ایران ورجاوندمان به مبارزه برخاسته اند . همین مناسبت برگزار میشود شرکت نمایند . جمعيت دفاع از جبهه جمهوری و دموکراسی که مرکز آن در کشور بلژيک است اعلام کرد به مناسبت سالروز 18 تير يک تظاهرات ايستاده برگزار می کند. 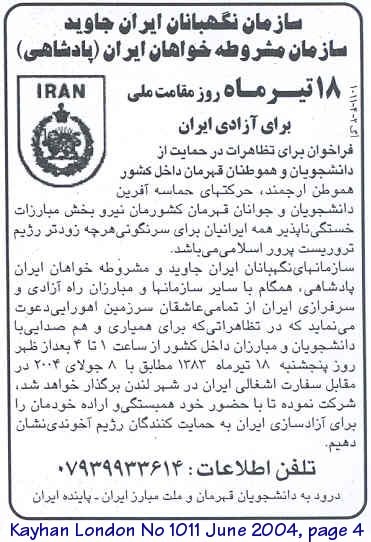 در اطلاعيه اين جمعيت آمده است: جمعیت دفاع از جبهه جمهوری و دمکراسی در ایران � بلژیک، برای گرامی داشت این روز و همبستگی با مبارزات دانشجویان و مردم کشورمان، تظاهرات ایستاده ای را در 17 تیر ماه سال 1383 برابر 7 ژوئیه 2004 از ساعت 2 تا 4 بعدازظهر در مقابل ساختمان شورای اروپا در بروکسل (میدان شومن) برگزار خواهد کرد. جمعیت بدین طریق از همه ایرانیان آزادیخواه و دمکرات دعوت می نماید، تا با شرکت و حمایت در این تظاهرات، همبستگی خود را با دانشجویان مبارز و آزادیخواه کشورمان، با زندانیان سیاسی و مبارزات مردم کشورمان اعلام کنند. به منظور دفاع از جنبش دانشجويی در ايران و اعتراض به ادامه حاکميت استبدادی جمهوری اسلامی، همايشی بزرگ در روز شنبه 3 جولای ساعت 2 بعد از ظهر در مقابل پارلمان نروژ برگزار می گردد. ما از همه افراد و نيروهای آزاديخواه ، احزاب و سازمانهايی که به ادامه حاکميت جمهوری اسلامی بر ايران معترض هستند دعوت می کنيم تا از اين همايش حمايت نموده و در آن فعالانه شرکت نمايند. دانشجويان، جوانان، ايرانيان مقيم هلند و تشکل مستقل �جنبش 18 تير� که فارغ از هرگونه وابستگی سياسی و جناحی می باشد، بر آن هستند که صدای فرياد دانشجويان ايرانی درون مرز را ديگر بار طنين انداز کنند و حمايت کنند. تداوم مبارزه به حق ملت ايران جهت رسيدن به آزادی و مردم سالاری. اين همايش همراه سخنرانی، يک قطعه نمايشی و موزيک زنده از هنرمندان ايرانی و راهپيمايی در سکوت می باشد. please shout the slogans in the native tongue of the country you're in NOT in farsi, talk to alot of people including the media, and pass out tons of flyers to bring awareness to the general public. There will be a protest to mark 18tir on Wed July 7th from 3pm-11pm and July 8th from 7am-3pm in front of the Iranian Embassy (245 Metcalfe) in Ottawa, Canada. Posted: Thu Jul 01, 2004 12:01 am Post subject: .. Excellent - this is good - now one in Toronto - and two days in Ottawa... ! what organization or group is sponsoring the event? Thousands of Iranians are expected to come into streets and squares of most Iranian cities and to support the planned actions of students and opposition groups. These wide spread protest gatherings will take place in order to commemorate the legacy of the "Epic of the Students Uprising of July 9, 1999" and in order to show the popular rejection of the entire system of the Islamic republic regime. These demonstrations are estimated to be extremly bloody as the Islamic regime which has increased the repression, intends to smash the popular actions. In all Iranian streets and squares, especially in the Enghelab, Amir Abad, Azadi, Baharestan, Narmak, Tehran Pars and Madar areas of the Iranian Capital. SMCCDI organizes the commemoration of the anniversary of July 9-14, 1999, Student Uprising of Iran and its legacy. Participants will cherish the memories of those fallen during the bloody governmental crackdown on the 5 glorious days of students protests. At the "Le Gala" room of the "Intercontinental Hotel" (former Kempenski) located at the junctions of North Dallas Parkway and Arrapaho Rd. 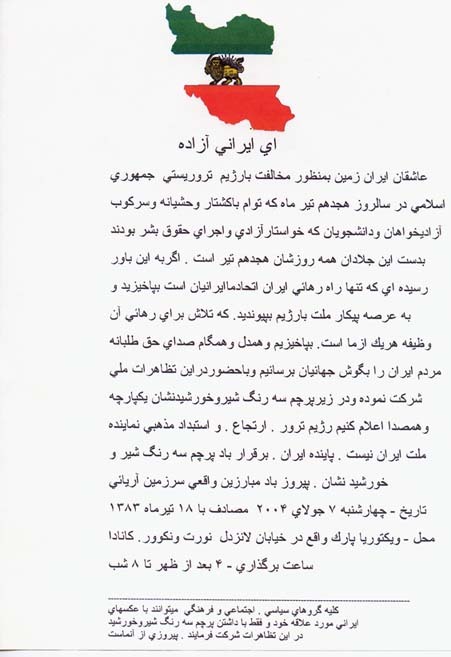 The Iranian community will march in order to commemorate the Student Uprising of July 9-14, 1999, and to demonstrate their solidarity with enchained Iranians. The demonstrators will request the end of the German government's collaboration with the Islamic regime and pressures on the Mullahcracy in order to respect Human Rights in Iran and to step down from political power. 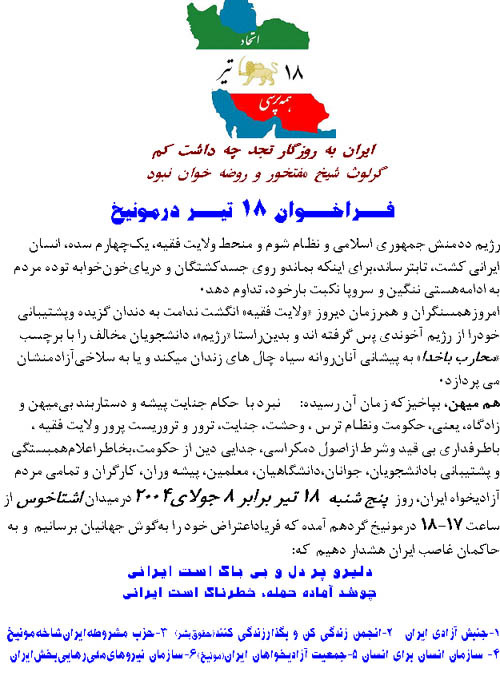 SMCCDI organizes the commemoration of the July 9-14, 1999, Student Uprising Iran and its legacy. This demonstration will follow the SMCCDI Demo of July 8, 2004, in front of the regime's Embassy. The Iranian community will gather in order to commemorate the Student Uprising of July 9-14, 1999, and to demonstrate their solidarity with enchained Iranians. The Iranian community will gather in the US Capital in order to commemorate the Student Uprising of July 9-14, 1999, and to demonstrate their solidarity with enchained Iranians. The demonstrators will request the public moral support of the Iranian secularist movement and the US pressure for free elections in Iran. Iranians and Swedish freedom lovers will gather for the commemoration of the July 9-14, 1999, Student Uprising of Iran and its legacy. They will show their rejection of the Islamic republic and cherish the memories of those fallen during the bloody governmental crackdown on the 5 glorious days of students protests. SMCCDI organizes for the 3rd consecutive year the commemoration of the July 9-14, 1999, Student Uprising of Iran and its legacy. 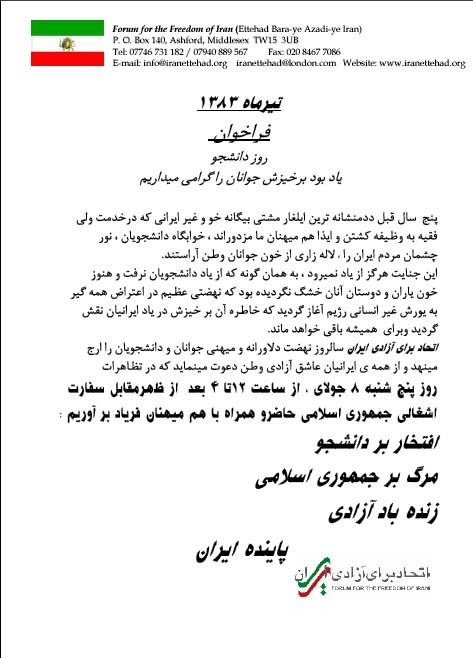 It's to note that this demonstration will take place in the Capital of the Islamic regime's closet ally, in front of the Islamic Republic Embassy. Participants will show their rejection of the Islamic regime and cherish the memories of those fallen during the bloody governmental crackdown on the 5 glorious days of students protests. Iranians will gather for the 2nd consecutive day in front of the Islamic republic's Embassy in order to condemn the persistent repression in Iran and in order to cherish the legacy of the Students Uprising of 1999. Iranians will gather, in front of the regime's Embassy, for the commemoration of the July 9-14, 1999, Student Uprising of Iran and its legacy. They will show their rejection of the Islamic republic and cherish the memories of those fallen during the bloody governmental crackdown on the 5 glorious days of students protests. They'll also denounce the support made, by Jack Straw and the Britsh circles, of the Mullahcracy. 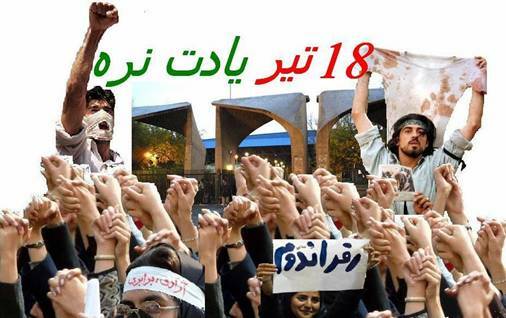 Iranians will gather for the commemoration of the July 9-14, 1999, Student Uprising of Iran and its legacy. They will show their rejection of the Islamic republic and cherish the memories of those fallen during the bloody governmental crackdown on the 5 glorious days of students protests. Iranians will gather for the 2nd consecutive day for the commemoration of the July 9-14, 1999, Student Uprising of Iran and its legacy. They will show their rejection of the Islamic republic and cherish the memories of those fallen during the bloody governmental crackdown on the 5 glorious days of students protests. The demonstrators will request for the Canadian government's pressure on the Islamic regime in order to respect Human Rights and to bring to an open justice the murderers of Zahra Kazemi, the Iranian Canadian journalist killed last year by the regime. 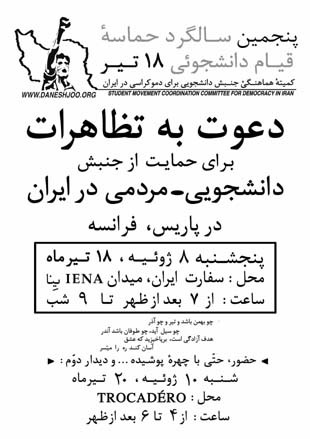 The Iranian community of S. California, along with opposition groups such as SMCCDI, will gather in order to commemorate the Student Uprising of July 9-14, 1999, and to demonstrate their solidarity with enchained Iranians. Held a day earlier than inside Iran, in order to show the Diaspora's solidarity, a protest march will also take place at the same occasion. The Iranian community of San Francisco will gather near the Stanford University in order to commemorate the Student Uprising of July 9-14, 1999, and to demonstrate their solidarity with enchained Iranians. Iranians will gather in front of the European Union's Building in order to condemn the support of the illegitimate Islamic republic regime by main European countries. The will cherish the memories of all those fallen for the cause of Freedom and Secularity in Iran and especially the students who uprised in July 9, 1999. Iranians will gather in front of the Islamic republic's Embassy in order to condemn the persistent repression in Iran and in order to cherish the legacy of the Students Uprising of 1999. During this advanced action, the protesters will also denounce the deals made between the Statoil company and the clerical regime. Iranians of N. California will gather in order to condemn the Islamic republic regime and to cherish the legacy of the Students Uprising of July 9-14, 1999. Corner of 4th Ave. and Pike St. Thank You updated the main list. Time: Wednesday July 7th 2004 from 6:30 to 8:30 p.m.
From Far Left to Furthest Right and everyone in between! we will all walk together side by side: Against the Fascist Mullacracy in Iran. And to support uprisings inside Iran. Nice, I saw that many of the protests were listed there..
thanks for the heads up Spenta! MM... the website pax protest is a "anti-Us" website..
what if they know that the Iranians love America and Israel ? After all, Indymedia calls the Iranian Students "CIA Agents!"